Spin Genie Casino is a Gaming Realms powered mobile slots and games website for UK players. The casino specialises in real money gaming and is the creator of a variety of Slingo, slots and casual games. If you’re looking for a mobile-first design, instant wins and original gaming content, Spin Genie has the lamp! Bar x slots represent some of the best arcade fruit machines around, but what about online? 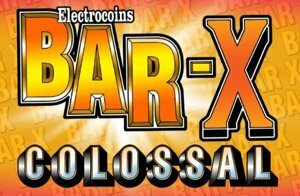 Bar X Colossol from Slingo Originals takes things up a notch, with free spins and giant 3×3 symbols. You can’t go wrong with Roulette Touch from NetEnt. This is one of the best mobile roulette games ever created for smartphone and tablet. Set in a leprechaun brewery, Rainbrew from Microgaming offers an incredible 1, 125 ways to win. Thanks to a special sidewinder feature, we’ve never seen so many ways to win. Rainbrew has free spins too! Help penguins escape and win cash in the new slot from Yggdrasil Gaming. The Penguin City slot has a penguin escape mode and stacked emperor penguin wilds. There’s an original quality to SpinGenie.com that other mobile casinos don’t have, it’s called Gaming Realms. Built using the Grizzly platform, Spin Genie is a mobile-first games engine with more than 500 ways to win money. Options include online slots, Slingo, live casino and originals, bespoke games exclusive to the brands of Gaming Realms. The mobile casino itself is well designed. In the top right players can find the menu for games, promotions and account control. Unlike other sites I’ve seen, Spin Genie has a deposit section that’s particularly useful with bonuses, wager history and game activity etc. This is helpful because it’s right there in the main menu, and not hidden within your account. Spin Genie’s home page is divided into easily accessible areas. These include featured games, slots, casino, Slingo originals, live casino and jackpots. Also included are an instant wins section and Slingo Boom menu. Basically, Spin Genie mobile casino makes it very easy to find games. SpinGenie.com is owned by Bear Group Ltd who is wholly owned by Gaming Realms PLC. A company listed on the London Stock Exchange. The casino is licensed and regulated by the Alderney Gambling Control Commission. Spin Genie’s UK based gambling services are licensed by the UK Gambling Commission. As an exclusive slot site for UK players, accounts and services are managed from Guernsey in the Channel Islands. Highlights of this review include the Spin Genie VIP program, Slingo originals games (which are very good) and new slots. Promotions at the mobile casino are frequent while new members can benefit from a welcome bonus. Details of this bonus can be found at the top of this review. Gaming Realms is all about next-generation gaming. Not only do they make their own games, but their casinos integrate with other top developers. This puts mobile slots and games in the high hundreds. In fact, at the time of this review, I counted 500 plus. That includes over 70 instant win casino games. Spin Genie offers more than 500 ways to win money. That’s staggering for any mobile casino, putting the brand high-medium in terms of size. You can find games from NetEnt, Yggdrasil Gaming, Microgaming, Realistic Games and Blueprint amongst others. What’s most impressive is the variety and quantity of games on offer. While predominantly online slots, the site offers extensive real money gaming. You can search for games using the Spin Genie search tool or browse by category. 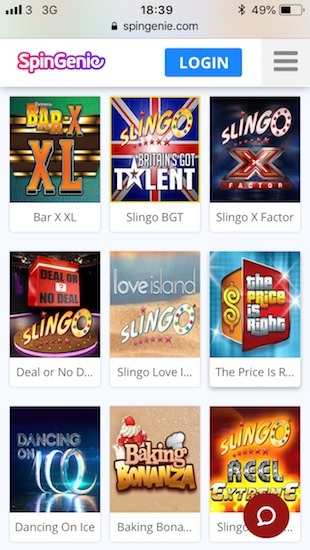 Categories include featured, slots, casino, instant wins, jackpots and my personal favourite Slingo originals. You can play 24 mobile casino games at Spin Genie including Realistic Roulette. One of the more impressive online roulette experiences. Slingo Shuffle Roulette is another originals bonus while NetEnt Roulette Touch offers unrivalled mobile roulette. Aces and Faces Power Poker is also worth mentioning as is Lucky Lucky Blackjack. The live casino is strong with 12 betting games including Dream Catcher (well worth playing). I’ll mention instant win games and Slingo originals separately. These games deserve their own mention. SpinGenie.com is one of the best mobile casinos for instant win games while Slingo originals adds unique gaming content. While reviewing Spin Genie Casino, I counted 73 instant wins. Now proving popular for their instant fortunes, instant wins include everything from online scratch cards to pick and win games. The prize pools look huge with instant wins like cash buster spin paying out up to £150K. Slingo Originals is an exclusive provider of innovative mobile games. 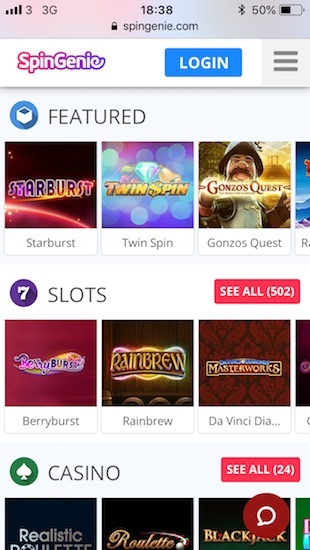 Specialising in social Slingo games (that’s combining slots and bingo), the developer has created Bar X slots and true skill gambling games that you won’t find anywhere else. Some Slingo Originals games worth pointing out include Bar X XL, Pay of the Dead and The Chase Slingo. That they’re available at Spin Genie mobile casino is a bonus in itself. As a regulated UK casino, SpinGenie.com is subject to stringent regulations that ensure player safety. Most importantly, security. At this website, deposits and transactions are protected using SSL 128-bit encryption for secure payments. These payment methods include Maestro, MasterCard, Mobile Deposit, Visa and Visa Debit. The minimum deposit for Spin Genie is £10. I would say Spin Genie is a very likeable mobile casino for UK players. Using the Gaming Realms platform, it’s easy to use, fast and full of games. Those games include new slots from the big developers, but the true winner is Slingo Originals, gaming content unique to just a few casinos. Add all that to a VIP program and you’re in safe territory. SpinGenie.com is a high-medium slots site and is recommended by Slotsquad.